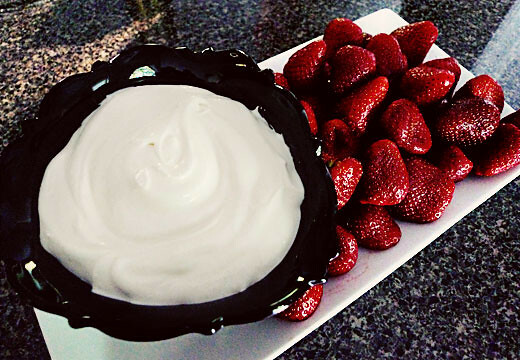 I created this fruit dip years ago on a whim, and haven't looked back since. It's easy, quick, and everyone loves it. It's got a mellow flavor, so it doesn't overpower the flavor of the fruit but accents it perfectly. Make it ahead, and whip it out just before a party with some fresh sliced fruit. I served it a few days ago with a tray of fresh pineapple, strawberries, grapes, and apple slices. Paired with some miniature gourmet chocolate bars, it was the perfect light dessert. Beat softened cream cheese until fluffy. Beat in Cool Whip. Beat in confectioner's sugar. Beat in lemon juice. Serve immediately with fresh fruit, or refrigerate until ready to use. It doesn't get much easier than that! The recipe also halves quite simply. I usually make a full batch for a party, or a half-batch for a small gathering. Erin, sounds yummy! I make something similar with a block of cream cheese, a jar of marshmallow fluff, and a teaspoon of vanilla. Good stuff and goes with pretty much everything!